Tonight was the ADHOC Showcase: the soul of the conference. The showcase is the event where attendees get to show off the hacks they've been working on for the previous two days or so. This year's showcase featured some excellent hacks, including a Google blinky-light badge synced up to blinky Google logos on web pages, a set of alternative kernel panic screens for Mac OS X, and a somewhat-self-aware robot. Like most ADHOC feature events, the Showcase started at midnight -- actually, a little later -- and ended about 3 AM. At that point, an impromptu geek film festival began, as we showed geeky clip after clip, including such classics as William Shatner singing Lucy in the Sky with Diamonds, Leonard Nimoy doing Bilbo Baggins, various Strongbad e-mails, webby favorites such as Hattan ar Din and Yatta!, the Humphrey Bogart version of Lord of the Rings, and many more. At 5 AM we decided to pack it in. And a geeky great time was had by all. One of the charming quirks of the ADHOC conference is that key sessions start at midnight and last for several hours, then sessions don't resume again until (usually) 11:00 AM the next day. The conference works with the hotel to let us nerds sleep during the day. We even have our own special Do Not Disturb signs that mean "REALLY do not disturb: even if it's 2 PM and the room hasn't been cleaned for 4 days, don't even knock." Unfortunately, somebody forgot which conference was here when they scheduled the window washers. They showed up at 8 AM yesterday with a cherry picker that beep-beep-beeped ceaselessly as they worked. So that wasn't good. ADHOC got off to a rousing start tonight with the traditional midnight pizza and keynote, this year presented by Apple's Jordan Hubbard. Actually, this keynote was not a keynote: it was a feature presentation. Apparently, there's only one guy at Apple who's allowed to give a keynote, and he wasn't here tonight. Congrats to NASA and friends. I have been happily drawn deeper into ADHOC, as I'm going to co-host the Showcase with the esteemed Andy Ihnatko. Will we approach the high standards set by the wonderful Scott & Greggy shows of the past? I dunno. But we promise to try to keep you awake. Happy Moonday, and welcome to Google Moon. Remember: drinking and Zamboni driving don't mix. 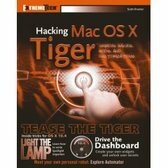 My new book is out: Hacking Mac OS X Tiger. It's got user tips and tricks, info about application bundles and how to tweak them, the defaults system, sections on Automator and Quartz Composer, running Unix and X11 apps, and 8 complete programming projects with source, including two Dashboard widgets, a Spotlight importer, and other cool stuff. The code was written by an all-star collection of Mac programmers, and it's all fully annotated and explained. I'm really happy with the way this book turned out. If you're interested in this sort of thing, please check it out. If I were in charge of Hell, I would reserve a special place just for radio stations that permit their DJs to talk over song "introductions" -- instrumental parts that come before the vocals begin. Hmm, the Inner Ring of the Seventh Circle sounds right, where they'll be crouching on the hot sand with moneybags around their necks. Of course, KFOG never does this. No, it's not the name of something that Google just bought: it's software. 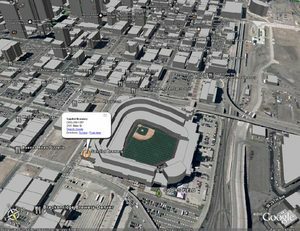 Google Earth is like Google Satellite Maps on steroids. You can get satellite views, zoom closer and farther, and fly from one location to another. You can search for restaurants, hotels, and other businesses and landmarks. There's a cool 3D view that lets you tilt and rotate what you're seeing. It's only on Windows for now, so if you're running Windows, go get your free copy. Be prepared to sink half a day or so into playing with it.